Catalan researchers have discovered a new species of mountain newt in the Montseny Natural Park. The new species has been given the scientific name Calotriton arnoldi , in honor of the British herpetologist E. N. Arnold. 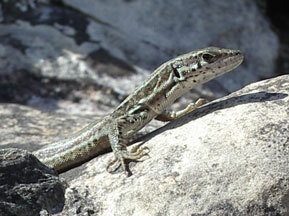 It is the only non-fossil endemic vertebrate species known to exist in Catalonia. The paper describing this discovery was recently published in the prestigious Zoological Journal of the Linnean Society . The C. arnoldi holotype, the specimen chosen by the authors as the species model, is on deposit at the Museum; it is the first holotype in the vertebrate collection. The Pyrenean newt ( Calotriton asper ) is the closest relative to the Montseny brook newt ; however, a number of genetic, morphological, and osteological characteristics make the Montseny brook newt unique. Some of the characteristics that differentiate C. arnoldi from its nearest relative include smoother skin, a translucent ventral area, and a chocolate-colored back. In addition, it is smaller, its throat has a pinkish-ivory color, and the vertebra at the base of the tail has a distinct morphology. The study compared the genetic sequences of individual specimens from distinct populations in order to establish the phylogenetic relationships. The results showed that the evolutionary line of the Montseny brook newt separated from that of the Pyrenean newt some 1.5 million years ago. However, the first Montseny brook newts were not found until 1979, likely due to their scarcity and very limited geographical distribution- they inhabit only a few streams within Montseny Natural Park. According to Carranza, the Montseny brook newt lives in cold water streams, where the water is clean and well-oxygenated, at an altitude greater than 600 meters. They can especially be found in areas populated by beech trees and also near holm oak trees.